PBS KIDS has announced the launch of the all-new WILD KRATTS World Adventure App for iPhone, iPad and iPod touch, a science-focused app based on the popular animal-themed children’s series. A must-have app for WILD KRATTS fans, World Adventure is now available only on the App Store, just in time for Earth Month and the start of WILD KRATTS’ third season on PBS KIDS. Through 30 levels of gameplay, WILD KRATTS World Adventure helps build key skills and encourages science inquiry. With the app, children ages 4 to 8 can tilt and tap their way through games that help them learn how different animals live and adapt to their habitats. WILD KRATTS World Adventure brings animal science to life. In each of the three games, kids observe, explore and use creature power suits to complete missions and help the Kratt Brothers. As children play along with Martin and Chris, they will learn important concepts such as how orangutans use momentum to swing from tree to tree, how dolphins jump in and out of the ocean and how woodpeckers find food in trees. As levels are completed, kids earn creature power “selfies,” habitat stickers and “Wow! Facts” that help further their environmental science and natural history learning. “Our goal is to make natural and environmental science fun for young children and to establish that enthusiasm early on, delivering the best content experience for every child across today’s many media platforms,” added co-creator Martin Kratt. The WILD KRATTS World Adventure App is available for iPhone, iPad and iPod touch for $2.99, only on the App Store or at www.AppStore.com/PBSKIDS. In addition to the app launch, PBS KIDS is celebrating Earth Month with its annual Explore the Outdoors initiative, which includes nature-themed content on-air, on digital platforms and in communities across the country. Season 3 of WILD KRATTS kicks off on Monday, April 7, as the Kratt brothers discover hermit crabs and shells on the beach in “Hermit Crab Shell Exchange.” The week continues with the exploration of animals from across the globe, including bison, black-footed ferrets, flying fish and more. The brothers explore science concepts such as adaptation and habitats. WILD KRATTS airs weekdays on PBS KIDS (check local listings). In each episode, creature teachers Chris and Martin Kratt take kids and their families along on extraordinary animal-powered adventures. The show transforms the Kratt Brothers, creators of the award-winning KRATTS’ CREATURES and Emmy-winning ZOBOOMAFOO, into animated versions of themselves, allowing the real-life zoologists to visit wild animals in their little-seen habitats and showcase key science concepts along the way. The series is a co-production of The Kratt Brothers Company and Emmy-winning 9 Story Entertainment. PBS KIDS has more than 30 educational apps available, designed to help kids build literacy, math, science and school readiness skills and more. 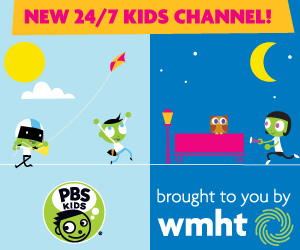 With a cross-platform approach, PBS KIDS is increasingly serving children and families across America wherever they live, learn and play. More information about PBS KIDS’ apps is available on pbskids.org/apps.